First row (left to right): Mildred Perdue, Victoria Waller, Likhitha Polepalli, and Christian Couvillion, Second row: Helen Peng, Ryley Fallon, and Sarah Perry, Third row: Indu Nandula, Victoria Gong, and Aja Ceesay, Fourth row: Jessikah Morton, Fifth row: Neziah Igwebuike, Audrey Wohlscheid, and River Gordon, Sixth row: Michelle Luo, Chylar Gibson, and Madison Wypyski. Not pictured: Landon Alexander, Morgan Emokpae, Catherine Li, and Sophie Tipton. Twenty-one current Mississippi School for Mathematics and Science students won forty-seven Scholastic Art & Writing awards for their literary works. All regional winners have been invited to the Regional Awards Ceremony on April 14 to receive their awards at the Eudora Welty House and Gardens in Jackson. 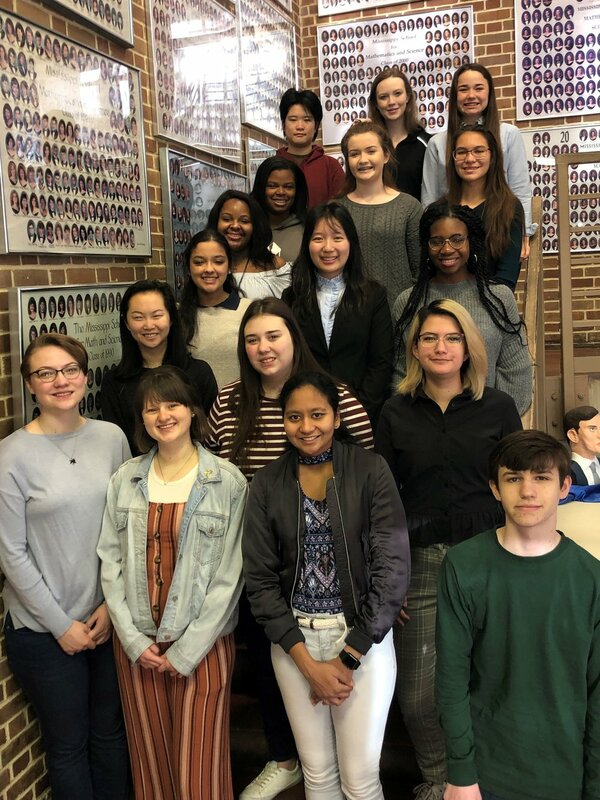 The works of the eleven Gold Key Award winners (Christian Couvillion, Ryley Fallon, Victoria Gong, Catherine Li, Michelle Luo, Indu Nandula, Helen Peng, Sarah Perry, Sophie Tipton, Victoria Waller, and Audrey Wohlscheid) will advance to national adjudication. The National Medalists will be announced on March 13 and will be recognized in part at the National Ceremony at Carnegie Hall in New York City. Emma Richardson, MSMS English Instructor expressed, “It's gratifying that readers and judges beyond our school recognize the excellence in our students' work.” She added, “Winning awards in the Scholastic Writing & Art Awards program, the oldest and most prestigious writing competition for high school students in the United States, is validation of the good work our students produce.” All winners are students of Mrs. Emma Richardson's Creative Writing classes. The Scholastic Art & Writing Awards program is the oldest and most prestigious writing competition for high school students in America. Ryley Fallon—Personal Essay/Memoir: "Lip-Plumping Lip Gloss and North Carolina"
Ryley Fallon—Poetry: "A Golden Arm"